Following a couple of somewhat experimental releases featuring the Fifth Doctor and Nyssa in ‘Winter for the Adept’ and ‘The Mutant Phase,’ writer Lance Parkin pens a more traditional Doctor Who tale featuring the duo. The core concept itself of a powerful entity taking control of a powerful artefact is nothing new, but Parkin handles it extremely well and heightens proceedings by writing of events that serve as a prequel to ‘The Keeper of Traken’ and feature The Source of Traken. ‘The Keeper of Traken’ is a beloved story for many reasons, but one of the lingering themes under the surface was always that Traken may not have been the idyllic paradise it proclaimed itself to be. 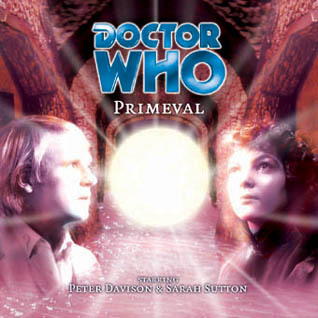 This comes much more the forefront in ‘Primeval’ as the Doctor boldly questions the Consuls about their flippant use of the death penalty; Hyrca and Janneus’s response that the death sentence serves the greater good screams of hypocrisy and moral greyness, and their eventual decision to have Nyssa disintegrated because she serves as a potential source of evil further exemplifies this. As events progress and the stakes raise, the cowering and fawning response of Traken’s Consuls to the invading Kwundaar drives home the point that these supposed elite beings house a greater degree of humanity and its flaws than they’d care to admit. Kwundaar as played by Stephen Grief is fantastic. He is undoubtedly the overall villain of the piece, his sound perfectly menacing to suit the part of a living god who inspires such loyalty in his followers, but he is characterised in a way that his motivations are quite clear and almost sympathetic if not righteous. The reveal that Kwundaar actually created The Source and was once worshipped by all of Traken is a fascinating one and explains his obsession with the Union as he is doomed always to be betrayed and is clearly still hurting from the initial betrayal some 3,000 years ago. If it weren’t for the slavery and piracy he authorizes as well as his intentions to kill everything by story’s end, he could almost come off as a character worth pity. It’s Kwundaar’s followers that deserve just as much awe and repulsion as well, though, as they are clearly a well-trained army that conquers Traken with relative ease, acting on Kwundaar’s behalf out of genuine choice rather than fear. Of the group, Narthex is the most fascinating character, committing his atrocious acts so that he will be rewarded heavily. Yet, in the end he betrays his god in the name of a greater good, a choice whose merits the story wisely leaves as ambiguous. The Source spares him, proving that he still has good in him even as he shoots another loyal Kwundaar supporter in Anona in order to save the Doctor, and the Doctor proclaims that all of the loyal supporters still have the opportunity to redeem themselves. Undoubtedly this act is a spurring point for some of the events seen in ‘The Keeper of Traken’ later on as the past no longer has to be the sole guiding force for one’s actions. As always, the regulars deserve special mention. Davison in particular does a superb job in portraying a slightly sterner Doctor, both as he vents his frustration to the overly bureaucratic Consul and as he confronts the powerful Kwundaar and uneasily starts a bargaining process. This is a Doctor not willing to lose another companion, and the foresight he displays in planning and the lengths he goes to save Nyssa without handing over The Source are great to see. Likewise, Sarah Sutton continues to improve as Nyssa on audio and emotionally portrays her character’s return to Traken as well as her mettle as she refuses to surrender to Kwundaar even when faced with death.